"Standard Starter Solenoid --. Therefore all implied warranties that may apply to your part are limited to the duration of this written warranty. Each warranty gives you specific rights, and you may have other rights which vary from state to state. "AC Delco Starter --. Series : AC Delco Professional. Starter design : DRSD200 Starter Design. Condition : New. Therefore all implied warranties that may apply to your part are limited to the duration of this written warranty. "AC Delco Starter --. Series : AC Delco Professional. overall starter length. Starter design : 5MT Starter Design. Condition : New. Therefore all implied warranties that may apply to your part are limited to the duration of this written warranty. "Standard Starter Drive --. Therefore all implied warranties that may apply to your part are limited to the duration of this written warranty. Each warranty gives you specific rights, and you may have other rights which vary from state to state. The picture listed on this page is a representation of the compressor you will be receiving. Not the exact one. In most cases, you will need to reuse your OEM plug, manifold, and sensors. • Tested for noise, vibration, durability, vacuum decay, and pressure decay to ensure no leaks and longer life. "AC Delco Starter --. AC DELCO STARTER. Condition : New. Therefore all implied warranties that may apply to your part are limited to the duration of this written warranty. Each warranty gives you specific rights, and you may have other rights which vary from state to state. "AC Delco Starter --. Series : AC Delco Professional. Starter design : SD210 Starter Design. Condition : New. Therefore all implied warranties that may apply to your part are limited to the duration of this written warranty. 1990-1990 Chevrolet Astro. 1982-1994 Chevrolet Blazer. 1992-1994 Chevrolet C1500. 1992-1994 Chevrolet C2500. 1992-1994 Chevrolet C3500. 1992-1992 Chevrolet Camaro 2DRRS. 1991-1993 Chevrolet Caprice 4DR Base. "New Era Starter Solenoid --. NEW ERA STARTER SOLENOID. Condition : New. Therefore all implied warranties that may apply to your part are limited to the duration of this written warranty. Each warranty gives you specific rights, and you may have other rights which vary from state to state. "Bosch Starter --. BOSCH STARTER. Condition : New. Therefore all implied warranties that may apply to your part are limited to the duration of this written warranty. Each warranty gives you specific rights, and you may have other rights which vary from state to state. AC Delco 323-428 Starter. NOTE: starter will likely require shimming for proper operation and durability. Remanufactured in the USA. Rest your cursor on the notation box to view IMPORTANT notes. Excel part number 6309. If your vehicle was not originally equipped with the EXACT part(s) listed, it is your responsibility to consult a dealer to see if it will fit your application. Part Number: 6310. Family owned and operated. Part Numbers: 336-1891, 6310MS. To confirm that this part fits your vehicle, enter your vehicle's Year, Make, Model, Trim and Engine in theCompatibility Table. Usa Industries part number 3742. 4.3L 260 V6 DIESEL ONLY. Interchange numbers: 1998553, 3742, 336-1877. 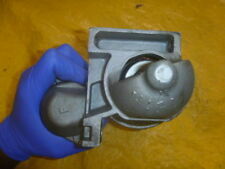 This part is remanufactured from BOSCH. Please read the instructions listed below: Part Number 25280 Status Active Model DRWD5MT Type Reman Starter System Voltage 12 Rated Power 1.2 kW Mounting Type PAD Pinion Teeth 9 Switch Terminal M5X0.8 POST Rotation CW Over Crank Protection No Battery Post M8X1.25 Domestic Shipping Your order will be shipped within 1 business day after the payment has been received and cleared. It usually takes 2-10 business day for the package to arrive once it has shipped. The order will be send to the address provided by Paypal, please make sure you have the correct address. In case the package is send to an incomplete address and returned, we will resend it, buyer pays shipping. Payment Payment must be received immediately. Please read the instructions listed below: Part Number 25067 Status Active Model DRWD5MT Type Reman Starter System Voltage 12 Rated Power 1.2 kW Mounting Type PAD Pinion Teeth 9 Switch Terminal M5X0.8 POST Rotation CW Over Crank Protection No Battery Post M8X1.25 Domestic Shipping Your order will be shipped within 1 business day after the payment has been received and cleared. It usually takes 2-10 business day for the package to arrive once it has shipped. The order will be send to the address provided by Paypal, please make sure you have the correct address. In case the package is send to an incomplete address and returned, we will resend it, buyer pays shipping. Payment Payment must be received immediately. L4 GAS OHV Naturally Aspirated. V6 GAS OHV Naturally Aspirated. l4 GAS Naturally Aspirated. V6 GAS Naturally Aspirated. 1984 Chevrolet Cavalier CL Sedan 4-Door 2.0L 122Cu. 1986 Buick Century Limited Sedan 4-Door 2.8L 173Cu. Part Number: 6309MS. Part Type: Starter Motor. FIND THE RIGHT PART FOR YOUR CAR. Overdrive has been in the automotive parts industry for over 15 years. Newly Listed. QUICK LINKS. MIRROR ASSEMBLIES. MIRROR GLASS. Product Type: Starter | Replaces: 428000-1820 4280001820 | Starter Type: OSGR | Volts: 12 | Teeth On Drive: 11 | Rotation: Clockwise | Source: Aftermarket . Manufacturer: Suncoast Automotive Products (Now MPA). Part Number: 3565. Pontiac 6000 1982 2.5L. Chevrolet Citation 1981-1983 2.8L. Chevrolet Citation 1981-1982 2.5L. Chevrolet Celebrity 1982-1983 2.8L. • Zinc plated field case, solenoid, C.E. plate. Lester Nos:3571, 6310, 6317. Replaces:Delco 10455004, 10455017, 10456017, 10465033, 10496888, 10496889, 1109538, 1109560, 19136200, 1988430, 1988722, 1988723, 1998445, 1998448, 1998450, 1998514, 1998515, 1998526, 1998530, 1998546, GM 10455004, 10455017, 10465033, 1109538, 1109560, 1988722, 1988723, 1998450, 1998515, 1998530. Model: BUICK LESABRE. BUICK LESABRE (80 & UP) 96-97 (6-231, 3.8L). Starter Motor. BUICK PARK AVENUE (80&UP) 96 (6-231, 3.8L). BUICK ELECTRA (80&UP) 85 6-181 (3.0L). BUICK PARK AVENUE (80&UP) 85 6-181 (3.0L). Manufacturer: Suncoast Automotive Products (Now MPA). Part Number: 6310. GMC Safari 1985-1990 2.5L. Chevrolet Lumina 1990 2.5L. Chevrolet Citation II 1984-1985 2.5L. Chevrolet Celebrity 1984-1990 2.5L. Product Type: Starter | Replaces: 10455010 10455096 323-472, 323-474, 323-503, 323-529, 323-472 | Starter Type: DD | Volts: 12 | Teeth On Drive: 9 | Rotation: Clockwise | Kw: 1.6 | Source: Aftermarket . LESABRE 96-97 (6-231, 3.8L). REGAL 96 6-231 (3.8L). EIGHTY EIGHT 96 (6-231, 3.8L). PARK AVENUE 96 (6-231, 3.8L). NINETY EIGHT 96 (6-231, 3.8L). BONNEVILLE 96 (6-231, 3.8L). Keep in mind that interchanging parts may require you to strip the part to its most basic assembly and reuse your accessories from your bad part assembly. Part Number: 96106. Starter Rotation : Clockwise. Part Numbers: 1-06415, 336-1138, 336-1138A, 337-1008, 3565, 6415, 6415N, 6415R, PP6415N, PP6415R, QSA6415N. To confirm that this part fits your vehicle, enter your vehicle's Year, Make, Model, Trim and Engine in theCompatibility Table.